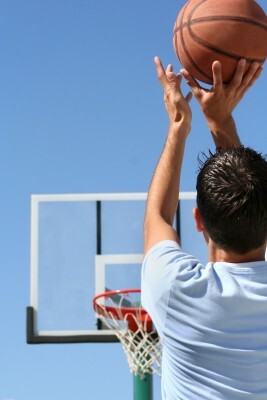 Shooting is arguably the most important aspect of basketball. After all, the points on the scoreboard determine the winner and you only get points up there by shooting. By learning and going through effective basketball shooting drills, we ensure that when we're in the game in the heat of the moment, our shot is AUTOMATIC. You want to get to the point where you don't even think about it, its second nature. So check out some of these drills. Stand in one spot on the court and have a partner feed you the ball. Take the shot immediately as if it was a real game; step into the shot. Repeat this again and again from different spots on the floor to simulate a real game situation. *If you’re alone either dribble the ball and shoot or throw the ball to a certain spot (throwing as in bounce it somewhere so you can get to that spot and catch it; don't throw it into space), jump to the ball, catch it and shoot. The key here is to catch and shoot the ball in rhythm. See, in an actual game, you won’t be standing in one spot holding the ball ready to shoot. You'll be running around trying to get open or creating your own shot; you'll be MOVING. 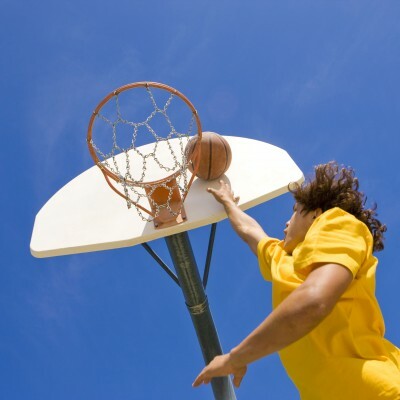 This is a great drill to do when you’re by yourself at the park or in the gym. Involves running back and forth, gets you tired, improves your endurance and your shooting. This is an important drill because it simulates what happens in a real game. Occasionally, you may get wide open during a game, but most of the time someone is going to contest your shot by running at you, yelling, or jumping at you. Have a friend or a teammate run at you and try to block your shot as if it were a real game. Keep doing this from different spots on the court; set some goals for yourself like say you have to make a certain number of shots before you move. Another thing you can do is have someone just wave a broom at you or anything to distract you. Get a friend or a teammate and have them hold a football blocking shield (or anything that’s padded and can be held securely). Have him stand underneath the basket and while you drive to the hoop as if you’re scoring in a game. He’s going to raise the shield/pad and hit you with it as if a defender was jumping up to block your shot. The purpose of this drill is to get good at FINISHING shots while or after absorbing contact. Many players are great at making shots in the gym or in practice, but it’s a different story in the game with defenders. The bank shot is the most underused shot today. Use it! Practice shooting all bank shots (shots off the glass/backboard) from all angles from all spots on the court, Set some goals; make 10 in a row before you move to a different spot. This is drill is to make your off hand just as efficient as your strong/dominant hand. If you’re right-handed, your off-hand would be your left hand. 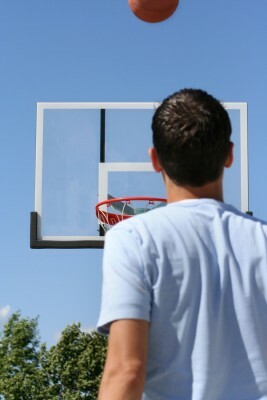 Stand right by the basket on the left side and make 10 in a row with your left hand only. Once you can do that, do 20, then 30, and so on. Do this everyday or as often as you can and you will see an improvement. You will expand your game and become more versatile; being able to finish on both sides with both hands is an extremely useful tool to have in your arsenal. *Let's assume the player in the picture is left-handed, so he's practicing his off-hand.